LADIES KAFTANS SUITABLE FOR ALL OCCASIONS FROM RELAXING AT HOME TO GOING ON HOLIDAY OR DRESSING UP WITH JEWELLERY OR A SCARF FOR A SPECIAL OCCASION. For customers who have a larger or smaller measurement, it would be advisable to request theBespoke version. FRINGED NECK KAFTAN - BLACK Black panne-velvet kaftan with a beaded fringe decoration to the V neckline. Chiffon edges to the sleeves. Lovely smart kaftan for special occasions. Available in a choice of length. This loose fitting kaftan is generously free-sized and suitable for all dr..
FRINGED NECK KAFTAN - RED Red panne-velvet kaftan with a beaded fringe decoration to the V neckline. Chiffon edges to the sleeves. Lovely smart kaftan for special occasions. Available in a choice of length. This loose fitting kaftan is generously free-sized and suitable for all dress-..
A SMART KAFTAN THAT IS SUITABLE FOR ALL OCCASIONS FROM RELAXING AT HOME TO GOING ON HOLIDAY OR DRESSING UP WITH JEWELLERY OR A SCARF FOR A SPECIAL OCCASION. 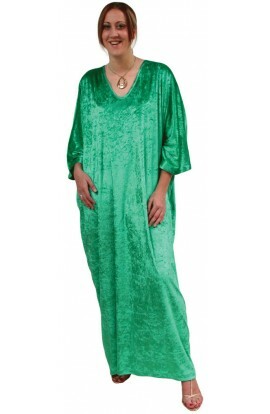 This long, full-length kaftan is made up in really lovely quality smooth velour. This fabric has an abstract pattern of an animal-type.. Crushed velour kaftan. Long full-length Fully machine washable, non-iron We have made and sold this kaftan version in various colours for almost 25 years because it is so popular with our customers. It is made in washable, non-iron polyester jersey velour that has a lightly crushed pile ..
Knitted Velour Kaftan - Royal-Blue Crushed velour kaftan. Long full-length Fully machine washable, non-iron We have made and sold this kaftan version in various colours for almost 25 years because it is so popular with our customers. 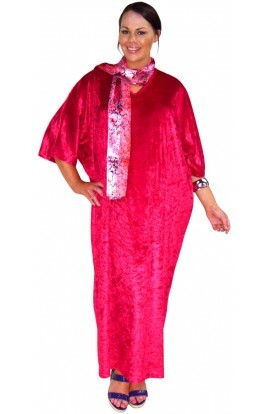 It is made in washable, non-iron polyester jersey v..
New vibrant colour Crushed velour kaftan. Long full-length Fully machine washable, non-iron We have made and sold this kaftan version in various colours for almost 25 years because it is so popular with our customers. It is made in washable, non-iron polyester jersey velour that.. SUITABLE FOR ALL OCCASIONS FROM RELAXING AT HOME TO GOING ON HOLIDAY OR DRESSING UP WITH JEWELLERY OR A SCARF FOR A SPECIAL OCCASION. We have made and sold this kaftan version in various colours for almost 25 years because it is so popular with our customers. It is made in washable, non-iron polyes.. PRINTED VELOUR KAFTAN - MAGNOLIA GLORY Ladies velour kaftan with magnolia tree blossom design. It has a lovely silky feel on the inside with a slightly crushed velour on the outside. The kaftan is of excellent quality with a really good drape. The standard cut of this kaftan is gradually.. 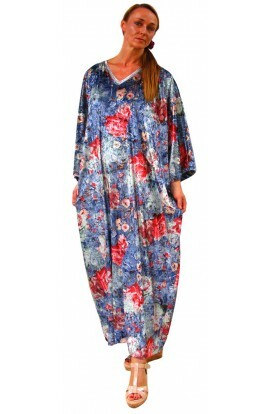 PRINTED VELOUR KAFTAN - SHY ROSE This kaftan is in various shades of blue, grey with muted pinky-red roses. The fabric has a tye-died effect background. The fabric has a lovely silky feel on the inside with a slightly crushed velour on the outside. The kaftan is of excellent qualit.. PRINTED VELOUR KAFTAN - SMALL FLORAL DESIGN ON AUBERGINE BACKGROUND This kaftan has a pretty small floral fabric design. It has a lovely silky feel on the inside with a slightly crushed velour on the outside. 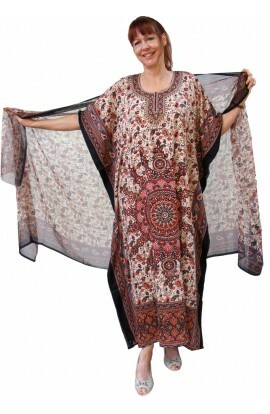 The kaftan is of excellent quality with a really good drape. The standard cut o.. This kaftan has a striking and unusual fabric design. It has a lovely silky feel on the inside with a slightly crushed velour on the outside. The kaftan is of excellent quality with a really good drape. The standard cut of this kaftan is gradually tapered inwards from the top down to the he..
A SMART KAFTAN THAT IS SUITABLE FOR ALL OCCASIONS FROM RELAXING AT HOME TO GOING ON HOLIDAY OR DRESSING UP WITH JEWELLERY OR A SCARF FOR A SPECIAL OCCASION. This long, full-length kaftan is made up in smooth velour. This fabric has an abstract tie-dyed pattern. Machine Washable A..
VELOUR KAFTAN - GOLD SILVER FLORAL This kaftan has a rather classy looking pewter-grey design on a rich goldy coloured background. It has a lovely silky feel on the inside with a slightly crushed velour on the outside. The kaftan is of excellent quality with a really good drape. The stan.. PRINTED VELOUR KAFTAN -PLATINUM PERFECTION This kaftan is two toned - Platinum and Silver It has a lovely silky feel on the inside with a slightly crushed velour on the outside. The kaftan is of excellent quality with a really good drape. The standard cut of this kaftan is gradually tape..
VELOUR KAFTAN - Rich Ruby-Wine colour with a white two tone design. It has a lovely silky feel on the inside with a slightly crushed velour on the outside. The kaftan is of excellent quality with a really good drape. The standard cut of this kaftan is gradually tapered inwards from the..